Construction of the John Hancock building in the historic Back Bay was completed in 1976. Before construction even began, there was great concern that the 60 story tower would upset the architectural appearance of the district, but the final result was a very beautiful structure that added ambience to the area. Nearby buildings reflect off the glass like a mirror, which showcases the design of older buildings, and can be described as a prominent symbol of old and new Boston. But this beautiful tower has an interesting history. In early 1972, the heavy glass windows began to pop out of the building during high winds. About 133 of the approximate 10,364 glass panes had smashed into the street below. The sidewalk was actually roped off to prevent injury to pedestrians. As a temporary repair, large pieces of plywood were placed in the resulting empty window frames, and were quite visible from far away. The building had the appearance of a checker board, or of a computer punch-card for those who remember the early days of data processing. The building was quickly nicknamed The Plywood Palace. Extensive engineering research and testing was done to determine the cause of the failures. I believe it was eventually discovered that the solder around the window frames was bonding too rigidly to the mirror coating on the glass, which caused cracks and eventually the entire pane to fall out. For many years, many Bostonians used self-deprecating humor that was inspired by the early history of the tower. For instance, if you lived in an unimpressive apartment located on a street beginning with "P," you would just replace the word "Plywood" with that street name. The Putnam Palace is an example of local humor that was prompted by the original window problems in the building. Also a strange note, the predecessor building at 200 Clarendon Street was the old Westminster Hotel. It had beautiful etched carvings along the outside of the higher stories. When the hotel was originally built, it violated Boston zoning laws and was constructed too tall, and several feet were eliminated from the structure in compliance (the descendant John Hancock Tower is the tallest building in the city). On January 20, 1973, more than 1000 panes of glass cracked in a massive chain reaction during a wind storm, with 3 panes popping out nine days later. 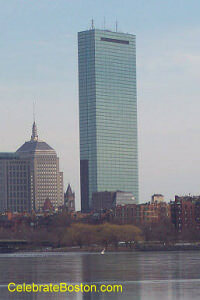 The John Hancock Tower was sold for $660 million at a foreclosure auction in New York City. The tower was purchased by Normandy Real Estate Partners and Five Mile Capital Partners. The building was previously owned by Broadway Partners, which paid $1.3 billion.